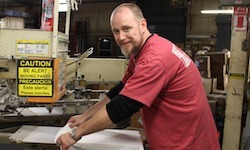 Founded in 1977, TS Designs began as a small, manual screen printing operation. It only took a few years for the company to become fully automated, printing shirts for big brands like Nike, Tommy, Polo, GAP, etc. However, after the 1993 implementation of NAFTA (the North American Free Trade Agreement), TS Designs watched as customer after customer transitioned accounts to Mexico in order to take advantage of lower costs. Instead of calling it quits, like many of their colleagues in the manufacturing industry, CEO Tom Sineath (retired in 2015) and president Eric Henry turned to fellow business owner and longtime friend Sam Moore for a new direction. Sam introduced Tom and Eric to the triple-bottom-line business model focused on three equally important bottom lines: People, the Planet, and Profits. 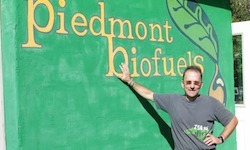 Armed with their new business model and a healthy amount of crazy, Tom and Eric sought to align themselves with, and cater to, a then-fringe group: The Green Movement. It was a period of steady progression, exciting new developments and lessons learned as the company leaders continually pushed the boundaries on what was possible in printing technology and what it meant to source from local supply chains. Today, TS Designs still sells largely to local, environmentally and socially-conscious businesses and organizations that make up The Green Movement, but also prints for any organization looking for a locally-made, better quality product with a better environmental and social impact. Eric Henry, CEO and President, continues with a spirit of innovation as the company expands its line of in-house apparel brands. You can help us be a successful example of a triple bottom line business as we continuously work to improve our social and environmental influence. Order your shirts from TS Designs! Front man extraordinaire, Eric Henry loves to engage and connect the community that surrounds TS Designs. His passion keeps the story of TS Designs and the company’s strides in the sustainable apparel industry in everyone’s hearts and minds. You can read Eric’s full bio here. Ask anyone in the company and they’ll tell you, “Shannon works magic.” Not only does he “wow” the entire team by keeping the Production schedule flowing smooth and to its highest efficiency, he also pulls off some amazing card tricks. Shannon has been with TS Designs since March 1996. 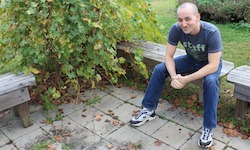 Eric started with TS Designs as an intern. He has the ability to think through just about any problem, see it at its fundamental parts and implement a solution. His positive impact can be seen in every department here at the company as he wears many hats through the day. 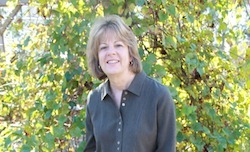 Lydia has been a member of the TS Designs team since 1989. She carries with her a wealth of knowledge when it comes to “how things work” at TS Designs. If you have a question, chances are Lydia has the answer! 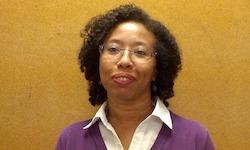 Darlene has been with the company since 2009. She’s always been interested in art and horticulture, and feels like being at TS Designs is a neat fit, since she gets to explore both interests. If you can’t find her at her desk in the art department, you can bet she’ll be outside enjoying the garden. We’d love to give you a tour! There are a lot of cool things going on at TS Designs, and we’re happy to show you around. Our monthly “Tours on the Tenth” are hosted the 10th of every month starting at 3pm. These tours are for individuals or groups of fewer than 5 people. Though you’re welcome to show up unannounced, we would appreciate if you would send in an RSVP email with the total number in your party. Pre-scheduled group tours are available with an appointment. Tours are $10/person for groups of 20 or fewer, $5/person for over 20 people. There is a $100 minimum. Tour fees will be applied to any shirt order your group submits within 30 days of the tour. A local lunch option* is available for an additional $10/person (reservations required). *Typically, we connect with our friends from Braeburn Farm located in Alamance County, NC for fresh beef which we grill into hamburgers. All our fixin’s come from our local co-op, Company Shops Market. Did you choose the “Pick Up at TSD” option on your retail order? If you’re a local, that’s a great way to save a little money! Connect with our staff in the front office to collect your order. You should be able to find Lydia easily as you walk through our main front door. Or you can use the bucks you saved to pick up a tee from our Breakroom Boutique – there are some great options available that aren’t available online. You can stop by anytime between 9am and 5pm on Monday through Friday.